The February issue is in the mail now! (FINALIST) in the 2015 Eric Hoffer Book Awards READ IT LIVE! 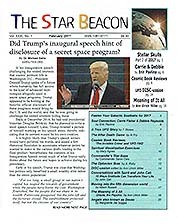 by Terra Rae and Crysta of "Team Earth"
DID TRUMP'S INAUGURAL SPEECH HINT OF DISCLOSURE OF A SECRET SPACE PROGRAM? "10 Ways Gratitude Can Transform Your Life"
"The Invisible Crime' and 'UFO FAQ"
"Fukushima can't be ignored"; "Interest in Bigfoot ongoing"; "Editor's brush with a possible Bigfoot." Events from the late '70s that helped lead the editor to where she is today. The February 2017 issue also contains classified ads and other intriguing tidbits of information you won't want to miss. READ THE ADS PAGE NOW! Order the current PDF issue here!